Happy October! We hope all you beauties are having a light-filled week. Anyone else been feeling the shift in seasons? Though you really have to pick up on the subtle changes here in LA, it’s still an exciting time in the year. It’s the perfect opportunity to really center within yourself and realign your energy in order to fully elevate to that high vibrational plane. It is Libra season after all, the season for balancing everything in our lives. We’re continuing our mini-series on chakras and focusing this time on our Anahata Chakra or heart center- the balance point in the body between the flow of the upper and lower triangle chakras. If you missed our first post on balancing the energy in your lower triangle we highly encourage you to read it here, so we can get to the alignment process of your heart chakra. As we covered in our last post, chakras are the major energy centers in the body where the highest amount of nerves collect, and each point is marked by the largest organs in our body and from there energy emits throughout your body + out into the world. Your chakras are the centers of your consciousness. As Einstein proved with E = mc2, everything is energy and within us our chakras are our energy centers. At every point in our day we are attracting on the same wavelength and energy plane of the vibrations our chakras are vibrating. If we’re not in sync, our energy levels are entirely thrown off and not only do we feel out of sync with our bodies, we begin to feel out of touch with the Earth around us. Balancing out your chakras gives you a life full of balance and BLISS. When in complete synchronicity with your chakras you’ll be able to fully manifest your visions and accomplish incredible things in this lifetime. Balancing your chakras is really the first step to rising up and harnessing a high vibrational life. Throughout our 8-week course, RISE UP you’ll be able to acknowledge + confront which chakras out of of balance and and use specific guided tools to reach an elevated level of harmony. So loves, let’s now move up to the next chakra in our series - the balance point. The heart chakra can regulate the energy flow to and from each chakra in your body. It’s the most powerful center in the body and if unbalanced, the heart chakra will keep you stuck. How do you know your heart center is wide open + balanced for energy flow? The heart chakra acts as a bridge between the lower and upper chakras. It’s about creating harmony between the upper energies and the lower energies, shifting the perspective from “me” to “we”. It’s located directly in the middle of your chest: affecting your entire emotional spectrum, including love for yourself and for others. A balanced heart chakra is shown by feelings of love, joy, gratitude and compassion. Trust is easily gained and accepted, while forgiveness easily flows. A balanced heart chakra creates strong, solid relationships both with yourself and with others. You create strong + healthy romantic relationships built on trust and acceptance. A balanced heart chakra emanates unconditional love; whenever it is completely open you are your true selves. A balanced heart chakra physically keeps your blood flow effortlessly and heart beat pumping regularly. If you’re experiencing blood pressure or circulation issues, it’s time to get your heart center back in check. On the opposite end, an underactive heart chakra is recognized by feelings of loneliness or shyness. You seek isolation and quickly sink to a level of depression. You may also have a lack of empathy and have trouble forgiving others. Maybe you just went through a break-up and are feeling a wave of all these emotions, it’s time to dig in on your heart chakra and work to realign it. An overactive heart chakra indicates signs of intense jealousy, harsh judgement and a need for acceptance. You may also be spreading that love a little too much. Every been that clingy person in the relationship or catch yourself gossiping with others? It’s time to spend time learning how to love yourself again. You have every reason to be loved and feel love. It’s just about connecting to that TRUE version of yourself. How do you heal + open your heart chakra? Because of the intense emotional connection drawn from this chakra, you’ll have to dig deep within yourself to find balance. It starts from shifting your perspective from a negative outlook to one that’s full of love + gratitude. True, easier said than done but through energy work and amazing healing tools like breathwork, meditation and Kundalini you can access these positive emotional levels, and FAST! Begin with simple breathwork and mantra practices for balancing the heart center. Start by doing 3 minutes of long deep breathing, expanding your stomach out on the inhale and contracting on the exhale. Try to complete a one minute breath three times - inhale for 20 seconds, hold for 20 and exhale. The power of the breath will help to balance the heart center. We go deep with specific breathwork for the heart chakra in week 4 in RISE UP!! Mantras are also a great way to affirm your work with this chakra - they help to provide focus to the specific area you wish to correct. The mantra for the heart chakra is HUM. Chanting this in meditation, in the car, whenever really, will help heal the physical heart and the emotional heart center. You’ll allow yourself to open up to unconditional love + compassion. We love to use food and herbs for healing and balancing the heart! Hibiscus, Rose, and Tulsi, and Matcha are great herbs to use! We love making them as teas and have great recipes in RISE UP for juices, elixirs, smoothies and meals. Herbs are so powerful and we swear by them!! The heart chakra is arguably the most important chakra, it’s the centerpiece of the chakra system. It is the place where our earthly desires and spiritual pursuits come together, and all of this rests on a foundation of love, compassion, and humble appreciation. When it is balanced, there’s joy and love to be found in the world and you attract more love and joy into your world. This is why it is so important for everyone to heal and balance the fourth chakra here in this time and space on Earth. At ETG, we are committed to raising our vibration to higher energetic levels on the daily and going higher and higher. Once we raise our energies and elevate ourselves, only then can we radiate to others + the globe. We love finding the power in numbers and raising our energy together. 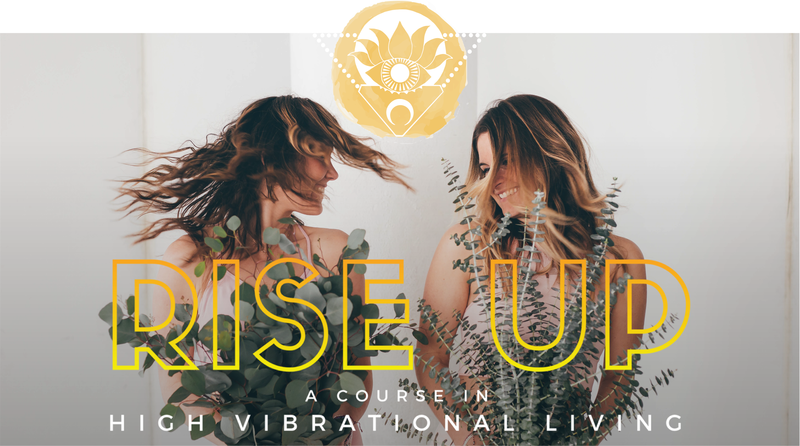 It’s why we created RISE UP: A Course in High Vibrational Living, to help you cultivate a high vibrational life through guided meditations with powerful ancient kriyas, poses and mantras that target each chakra. Kundalini is the most ancient and potent form of yoga and works the fastest to strip away all the junk, take out our garbage if you will, that’s hiding our inner light and create positive flow from the grounded to the spiritual planes. Finding balance guides us toward finding our true purpose and ultimately, our true happiness. In this Aquarian Age, the age of information, we have all we want to know at our fingertips. This influx of information is constantly thrown at us and it takes a lot of energy to balance ourselves out as we take it all on. In order to thrive and accomplish all we set out to do, we need to realign + open our hearts up to acceptance, compassion, gratitude and love. We need to become conscious in our energy levels so we can find true happiness. RISE UP is GOING LIVE AGAIN THIS SPRING/SUMMER 2019!!!! Check it out and JOIN US! What tools + techniques do you use to help balance your heart center? How do you immediately recognize your heart chakra is wide open? Share with us below or connect with us on Instagram! Hola High Vibe Warriors, If you joined us for our free Raise Your Vibration Challenge (p.s. you can still join if you d..